SO WHO & WHERE ARE WE? 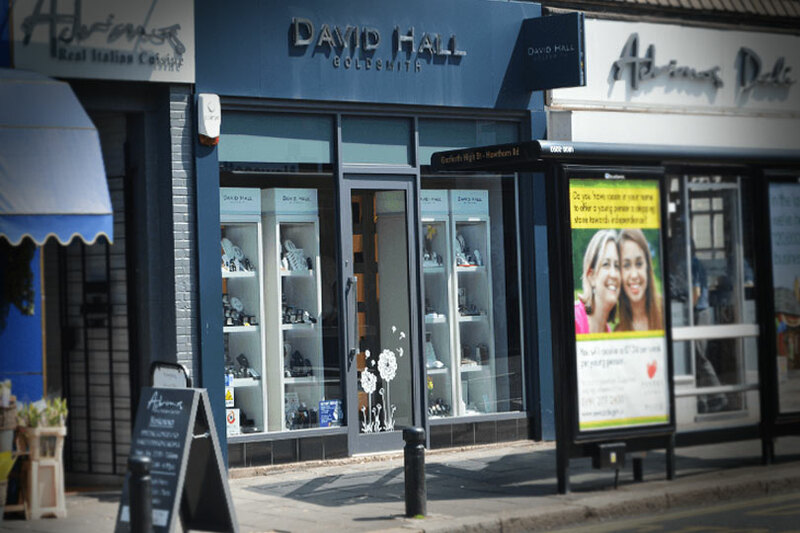 David Hall Jewellers are located on Gosforth’s High Street. Offering a huge range of quality jewellery and a bespoke designer service. We’re a family run business and we pride ourselves on giving our customers an excellent service. Now also offering the best online products and prices. Challenge us! To create a unique piece of jewellery bespoke to you, from single pieces to matching sets. At David Hall we can create beautiful pieces in different choices of metal, finished with diamonds or gemstones of your own personal choice. How would you like a wedding ring designed bespoke to you? We can design both his and her wedding rings to match, or a wedding ring created to your own personal specifications. Our jewellery shop is situated just out of the city of Newcastle in Gosforth and offers a huge choice of jewellery in store. Bring in your broken or unwanted gold, silver, diamond rings, coins in fact anything and we will give you a no obligation to sell free quotation. We offer some of the highest prices in the North East. Therefore if you are looking to shop around, please ensure you visit us first. and watch repairs our team will be able to advise you as best we can.